Evelyn Silver was involved with the Greenham Common Women’s Peace Camp for several years from 1981. She joined the march from Cardiff which culminated in women setting up a campsite at the US Air Force base, near Newbury, which housed Cruise nuclear missiles. Evelyn was an active supporter of protests at the camp, and was involved in dramatic interventions and performances. Her account is one perspective amongst the thousands of women who were involved throughout the camp’s existence. It sheds light on an important moment of the Cold War, and shows Loughborough’s connections with it. You can read the full interview with Evelyn Silver here. See here for information on materials and resources held by the British Library on social, political and cultural aspects of Britain in the 1980s. Read a Guardian article on the legacy of the protest on women here. 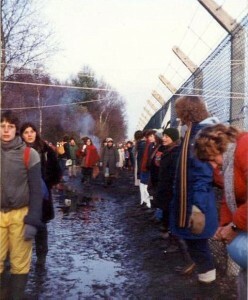 Read a leaflet from 1983 which was given out to supporters as they arrived at Greenham Common. 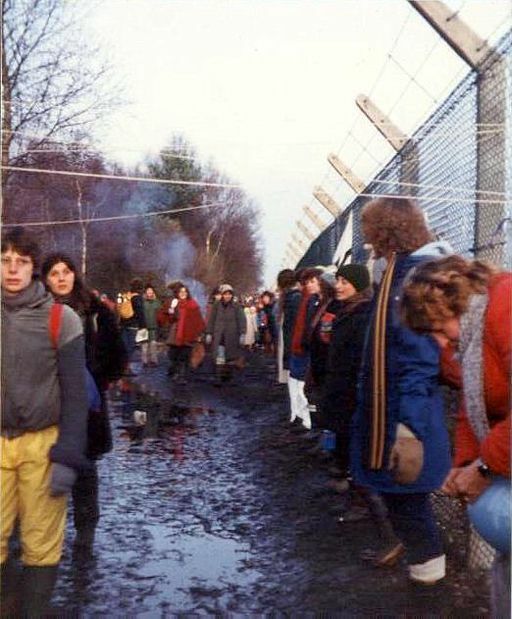 Women holding hands around the perimeter of the Greenham Common US Air Force base in Berkshire in December 1982. Photograph sourced from the British Library Social Sciences blog ‘The 1980s Archived’. Copyright of the image is owned by Ceridwen. It is licensed for reuse under the Creative Commons Attribution-ShareAlike 2.0 license.